Kennel TigerLiljas have a small breeding of smooth- and longcoated Chihuahua in the home environment. 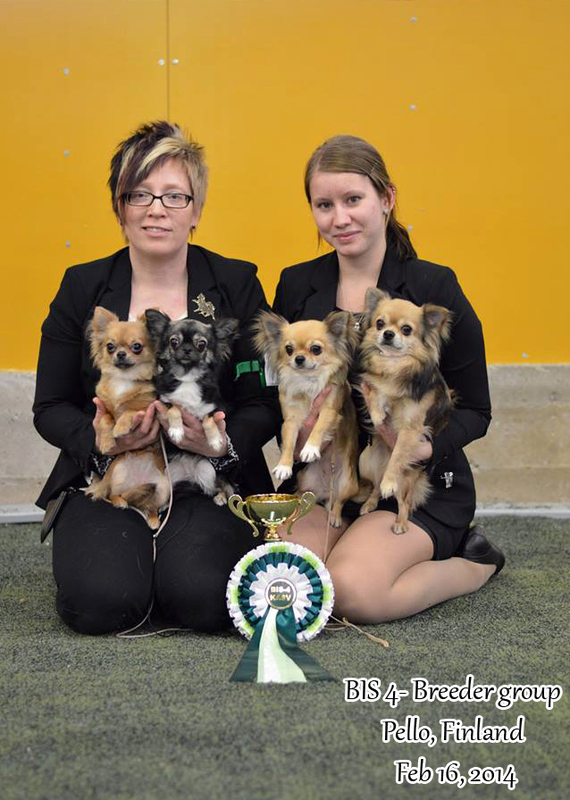 The kennel is approved by the FCI since 2007 and I am a member of the Swedish Kennel Club / SKK, the Swedish Chihuahua club and the Swedish Toydog club/SDHK. We follow their recommendations as regards the rules for breeding and selling. My goal with my breeding is to breed Chihuahuas that are sound, with an appearance typical for the breed, and with a lovely temperament and I have always had their knees checked before I use them for breeding. I only do combinations that I would consider keeping a puppy from myself. About me: My name is Ann-Charlotte Sundvall and I live far up in the north of Sweden, in a small village called Purnuvaara located about 40 km outside Gällivare, Lapland. My family consists of me Ancha, my partner Jan and our three children Joakim, Jessica and Marcus and of course our eight beloved Chihuahuas. I bought my first Chihuahua December 2004, the best Christmas present ever! We named her Ina also called TigerLilja (which also became the name of the kennel). She captured my heart with her ​​charm and ”essence” and ever since she has had a special place in my heart . My first meeting with dog shows made that I just wanted more .. and as time passed my thoughts of breeding grew up. I got as I mentioned earlier, my kennel name approved in 2007. We got our first litter in 2008 and has had about 1-2 litters each year since. I love breeding, but my main interest is dogshows and I attend as many as I can. We have expanded our kennel and now have nine Chihuahuas; Ina and her offsprings Cleo, Noomi and Gibson and three of Ina´s grandchildren, Lykke, Luna and Eddie (Noomi´s offsprings), Milo (our only smooth coat) and our import Charlie (c/o owned with kennel Chiwaow´s). I am so grateful for these wonderful dogs who give us so much love and joy. Welcome to look around on our website. We will update with pictures and info as soon as it happens something exciting. Copyright © 2014 Ann-Charlotte Sundvall, TigerLiljas. All rights reserved.